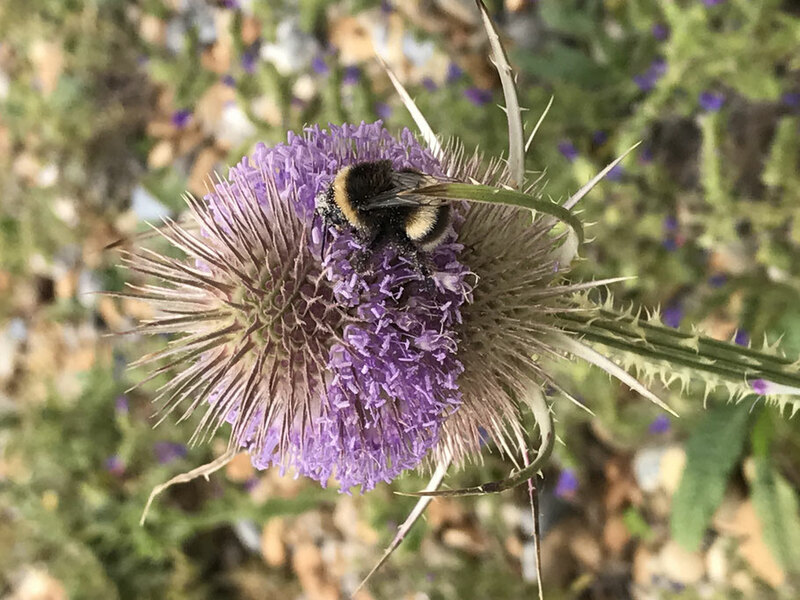 Life can be very strange some days, just like the common bumble bee clinging to this teasel, sucking out the last sacks of pollen its lifespan is tiny but every day its out collecting tiny grains of yellow pollen stuck all over its legs and underside but it never gives up till one day it just drops dead . The human race is no different we all race around like headless chickens trying to pay the bills look after our children and put food in their bellies but its normally not until its to late that we turn inward and connect to ourselves that we fully understand what we have just achieved by paying the morgatge off or trying to get to a place in life with a bit of security, doesnt work for everyone but on the other hand some seem to go through life with not too many problems , are they just lucky or does fate play a hand who knows, I have lost my dad and my mum and a sister but whos to say that they have not just moved on to a better place id like to think so, it would be very sad to believe that once we die that is the end of all that they were. I have run a crystal and fossil shop for over 17 years now and some days are so very strange, when you get total stranger pouring out their hearts to me and all the time they are talking no one enters the shop even if it is half an hour or longer, a lot of the time people just need a sounding board to let go of emotions that have collected in them from different problems in their lives it is a good realease for them as they always seem happier when they leave than when they arrived. The shop is packed with all sorts of crystals and fossils, there is always a good energy in the shop around them, it is just science nothing to do with new age or hippies this is science crystals have an energy squeeze quartz and it will create a Piezoelectric spark why do you think it goes in to watches and lighters and slithers of quartz are in most laptops and all sorts of things. The body's energy system is very much needed to make your heart beat and runs around the meridian system of the body, its just a connection of energy and vibration aand frequency nd nothing else nothing scary, we are all born with instinct and intuition, we have all come across both of these in our lives maybe you just did not feel right about a place or a person some situations that have got you feeling scared or insecure this comes from the stomach and is called a gut reaction, the sad thing is that it is very strong when you are young, and gets pushed to the back of your mind over your lifetime when the teachers at school shout and curse you for not understanding something or your parents telling you your stupid for doing something they did not agree with, but when you get to a certain age in your life it comes foward a gain making you ask questions about all sorts of things that you dont fully understand but hey ho that is just the fantastic world we live in so get used to it. Just because you read something in a book about space or how old the earth is doesn't mean its correct as everything that you know and perceive was all written by the hand of man whos to say it is correct? Just because someone tells you that you need a certain crystal which has happened many times in my shop give them the crystal that they were told to buy and then let them read a book about the crystal, nine times out of ten it will have no meaning to them whatsoever just tell them to look around and let their intuition and instinct choose the right one for them then let them read about it and it normally shocks them as to what that crystal actually means to them .